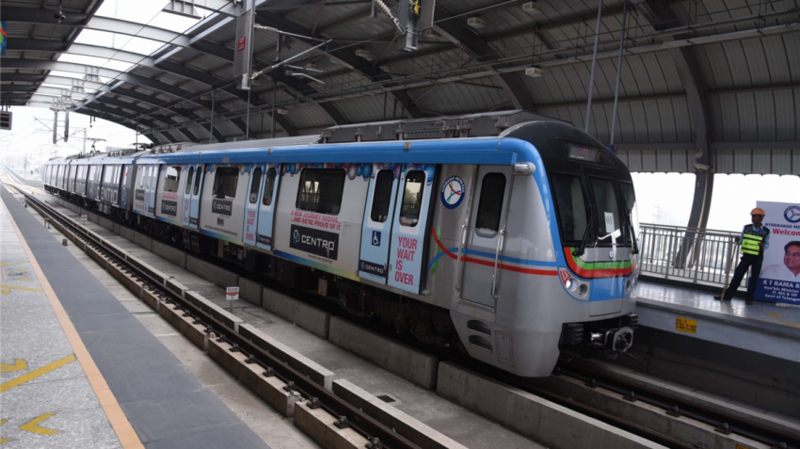 HYDERABAD (Metro Rail News): Hyderabad Metro Rail Limited (HMRL) is now focusing on completing works on Jubilee Bus Station (JBS)–Mahatma Gandhi Bus Station (MGBS) corridor by November 2019. According to the source, all the civil works have been completed on the 10-km route which forms part of corridor II. “Works pertaining to telecommunication, overhead cabling, electrical and signalling are going on at a brisk pace in all the 10 stations,” said NVS Reddy, managing director, HMRL. The works on viaduct have been completed and the works on roofs at stations are being executed. “The target is to complete the works by November 2019,” he said. For the remaining six stations from MGBS to Falaknuma stretch on the Old City route, survey for land acquisition has been completed. Nearly 2.2 lakh passengers now use the Metro with the launch of services on the Ameerpet—Hi-Tec City route. An estimated 40,000 to 50,000 commuters take the Ameerpet—Hi-Tec City route. “We are expecting a similar footfall on the JBS-MGBS corridor once the services commence as the route passes through one of the densely-populated corridors,” said senior HMRL official. JBS, Parade Grounds, Secunderabad, Gandhi Hospital, Musheerabad, RTC Crossroads, Chikkadpally, Narayanguda, Sultan Bazar and MGBS are the 10 stations on the route. The route will provide better connectivity between JBS and Secunderabad stations and with MGBS and make travelling easy for long distance commuters. Hyderabad Metro is now the second largest Metro in the country after the Delhi Metro with 56 km of Metro operations underway so far.